Our company is an illustrious name in the supplying and trading of superior quality range Natural Stone Tiles that are processed by our vendors with latest technologies and hi-end machinery. The diversified range of Natural Stone Tiles includes Stone Tiles, Quartzite Tiles, Limestone Tiles and Mica Tiles. Available at affordable prices these offers best value for money to our prestigious clients. 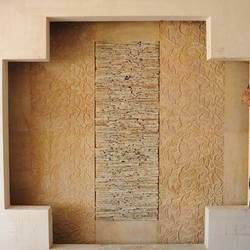 We are engaged in offering Natural Stone Murals to our esteemed customers. Made available in multiple carved designs, these murals provide a distinct character to the interiors. Designed and carved by skilled artisans, these murals have immense aesthetic appeal. We offer these easy-to-install murals in several specifications to suit the diverse requirements of our customers. Customers are reasonably charged for these murals. Looking for Natural Stone Tiles ?